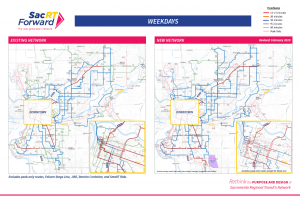 On Sunday, September 8, 2019, SacRT will roll out the new redesigned bus network, called SacRT Forward. The new bus system is user-friendly and has more direct routes. Updated schedules and information will be distributed in the coming months. Subscribe to our mailing list (below) to receive the latest information on the new bus network. 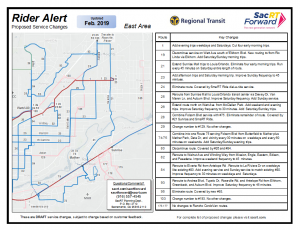 On Monday, February 25, 2019, the SacRT Board of Directors approved the SacRT Forward New Network plan, and directed staff to begin preparations for major changes to the Sacramento bus network, including changes to almost every route, which are scheduled to take effect in summer 2019. The focus of the new network has been on developing bus routes that serve major corridors that will lead to economic growth and reduce congestion. 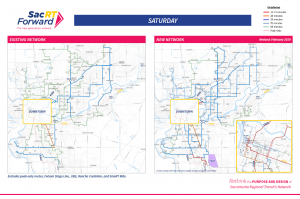 Adjustments have been made to almost every route, some minor and some much more substantial, which will provide better frequency, more weekend service and new and improved schedules. SacRT is investing up to an additional $3 million to retain and improve service. With additional local funding, we could implement more robust service in the future. In some areas where there is no demand for fixed-route bus service, or is not designed for large buses to navigate through neighborhoods, SacRT will deploy SmaRT Ride microtransit service. The defined SmaRT Ride service areas are currently in development. To learn more about this service, visit smartride.sacrt.com. Once the service changes are implemented, SacRT will continuously monitor each route to optimize and adjust service on a quarterly basis as needed. 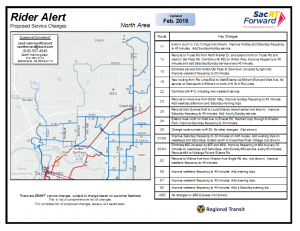 On February 18, 2019, SacRT unveiled an update to the proposed draft network. Below are updated maps, a summary of all the proposed route changes. 1 Greenback Improve evening frequency and reduce early morning frequency. Add new trips from Sunrise Mall at 6:29, 6:59, and 7:29 p.m. and from Watt/I-80 at 7:04, 7:34, 8:04, and 8:34 p.m. Eliminate trips from Sunrise Mall at 5:14 and 5:44 a.m. and from Watt/I-80 at 5:49 and 6:19 a.m. Eliminate weekend trips from Watt/I-80 at 5:06, 5:36, and 6:06 a.m. Add a Saturday trip leaving Sunrise Mall at 9:11 p.m. Shift Sunday/Holiday trip leaving Watt/I-80 at 8:36 p.m. 30 minutes later to 9:06 p.m.
2 Riverside Eliminate #2 Riverside except for the trips leaving Rush River Dr and Windbridge at 5:29, 6:29, 7:29, and 8:29 a.m. and at 3:29 p.m. and the trips leaving 8th Street and F Street at 7:25 a.m. and 2:25, 3:25, 4:25, 5:25 p.m., and 6:25 p.m. Change number to #102. 3 Riverside Express Change number to #103. No other changes. 5 Meadowview/Valley Hi Eliminate except for the outbound trip leaving Meadowview station at 7:16 a.m. and the inbound trip leaving Cottonwood Lane at 3:40 p.m. Change name and number to #105 Elsie. Alternate routes include new #56, 67, and 68 and new SmaRT Ride Gerber. 6 Land Park Eliminate #6 Land Park except for the morning trips leaving Rush River Dr at 7:13 and 8:13 a.m. and the afternoon trips leaving 8th/F Street at 2:07, 3:07, 4:07, 5:07, and 6:07 p.m.. The 2:07 p.m. trip would begin at Land Park & Vallejo Dr and not run during summer. Change number to #106. 7 Pocket Express Change number to #107. No other changes. 11 Truxel Extend route south to City College. Improve midday frequency to every 45 minutes, with peak-hour frequency remaining at 30 minutes. Improve Saturday frequency to 45 minutes. Add Sunday/Holiday service from 7:00 a.m. to 8:00 p.m. with 45 minute frequency. City College extension would run from 7th & F Streets, south on 7th St, west on P St, south on 3rd St, east on Broadway, south on Riverside Blvd, east on Vallejo Way, south on Land Park Drive, east on Sutterville Rd to City College station. In northbound direction, use 5th Street from Broadway to Q Street, to 8th Street. 13 Northgate Combine with Route 22 and extend north and west in Natomas. Eliminate part of existing route through Natomas. Improve headways to 45 minutes. Add Saturday/Sunday service with 45 minute frequency from 7:00 a.m. to 8:00 p.m. Extend north on Truxel Road, west on San Juan Road to El Centro Rd. From Arden/Del Paso station, new route would go east like existing Route 22 but extend to Butano Dr and El Camino Ave. Discontinue service on North Market Drive, National Drive, and on Northgate Blvd north of San Juan Road. Instead use San Juan Road to Truxel Drive. Continue service to/from Arden Fair Mall to 9:00 p.m. Keep existing peak-hour trips on existing #13 route on North Market Dr operated as new Route #113. 15 Rio Linda Blvd Eliminate route south of Arden/Del Paso station. Customers may use Blue Line instead or #11 Truxel along Richards Blvd. Improve Saturday frequency to 30 minutes from 8:00 a.m. to 7:00 p.m. Add a Sunday/Holiday trip from Arden/Del Paso at approximately 8:20 a.m., eliminate the trip beginning at Grand/Marysville at 8:55 p.m., and improve Sunday/Holiday frequency to 45 minutes from approximately 8:30 a.m. to 7:00 p.m. Extend evening trips that end at Marysville Blvd to Watt/I-80. 19 Rio Linda Add one Saturday/Sunday morning trip in each direction beginning an hour earlier on Saturdays and Sundays. New routing from Norwood Ave, east on Bell Ave, north on Rio Linda Blvd, west on Elkhorn Blvd, north on 2nd St, east on M St, to Oak St, 10th St, east on O St, south on Dry Creek Road, east on Elkhorn Blvd non-stop, north on Watt Ave to Elverta Rd. 21 Sunrise Operate all trips the full length of the route from Mather/Mills station to Louis/Orlando transit center. Eliminate weekday trips beginning at Sunrise Mall at 4:41, 5:11, and 5:41 a.m. and leaving Mather station at 5:22 a.m. Operate at 45 minute frequency on Saturdays until approximately 8:00 p.m. and 60 minutes until approximately 10:00 p.m. Eliminate Saturday/Sunday trip beginning from Sunrise Mall at 6:12 a.m.
22 Arden Combine with Route 13. 23 El Camino Shift trips beginning from Arden/Del Paso station at 9:45 and 10:45 p.m. later approximately 5 minutes for train transfers. 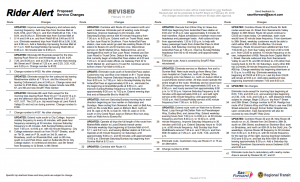 Adjust schedules to maintain more even headways and passenger loads. Add outbound trips from approximately 1:30 to 3:00 p.m. to help with heavy passenger loads from Arden/Del Paso to Watt Avenue. Add Saturday morning trip beginning at Arden/Del Paso at 7:48 a.m. Improve Sunday/Holiday headways from 60 to 45 minutes until approximately 7:00 p.m.
24 Madison/Greenback Eliminate route. Area is covered by SmaRT Ride microtransit. 25 Marconi Eliminate service on Madison Ave and to Sunrise Mall. New route would go from Mercy San Juan hospital on Coyle Ave, north on Dewey Drive, continuing onto Van Maren Ln, north on Auburn Blvd to Louis/Orlando transit center. All trips would operate the entire length of the route. Weekday service would have 30 minute frequency from approximately 5:00 a.m. to 8:00 p.m. and hourly service from approximately 8:00 p.m. to 10:30 p.m. Improve Saturday frequency to 45 minutes until approximately 8:00 p.m. and add night service at 60 minute frequency until approximately 10:00 p.m. Add Sunday/Holiday service at 60 minute frequency from 7:00 a.m. to 8:00 p.m.
26 Fulton Extend route north on Watt Ave to Elverta Road. Loop through McClellan Park via Peacekeeper Way, Dudley Blvd, and James Way. Extend weekday evening hours from 7:00 p.m. to 8:00 p.m. at 30 minute frequency and from 8:00 p.m. to 10:30 p.m. at 60 minute frequency. Improve Saturday frequency to 30 minutes until 6:00 p.m. Extend Saturday hours to 10:00 p.m. at 60 minute frequency. Add Sunday trips from Watt/Elverta around 7:30 a.m. and 7:00 p.m. and from 65th St station at 7:29 a.m. and 6:29, 7:29, and 8:29 p.m.
28 Fair Oaks/Butterfield Eliminate route. Customers may use Route 21 or 75 as an alternative. 29 Arden/California Ave Change number to #129. 30 J Street Combine Route 30 and Route 38. Both routes would use J/L Street from Sacramento Valley Station to 39th Street. Route 30 would continue to CSUS as it does today. On weekdays, each route would have 30 minute base frequency. From downtown to 39th Street, weekday customers would be able to catch either #30 or #38, for effective 15-minute frequency. Route 30 would have additional trips from 7:00-8:30 a.m. from Sac Valley and from 2:30 to 5:00 p.m. from CSUS to achieve 15 minute frequency on its own, independent of #38. Reroute from Capitol Mall to L Street. Reroute outbound trips from Sacramento Valley to use H St, and 6th St direct to J St rather than looping back to 3rd St. On Saturdays, every other #30 trip (currently 30-minute frequency) would become a #38 trip. Change weekday trip beginning downtown at 9:10 p.m. to a #38 trip. Eliminate weekday trip beginning at CSUS at 9:23 p.m. Last trip from CSUS will remain at 9:53 p.m.
33 Dos Rios No changes. 34 McKinley Eliminate route except for morning trips beginning at 6:03, 7:03, and 8:03 a.m. and evening trips beginning at 2:30, 3:20, 4:20, and 5:20 p.m., with departure times subject to change. Begin 2:30 p.m. trip from F Street and 29th Street. Change number to #134. Realign bus route off of Coloma Way and Pala Way to use new 53rd Street extension through former Sutter Hospital site, upon construction. East Sacramento will also be covered by new SmaRT Ride Zone. 38 P/Q Streets Combine Route 30 and 38. New Route 38 would run on J/L Streets from 3rd Street to 39th St, south on 39th Street, southeast on Stockton Blvd, east on Broadway, and north on 65th St to the Gold Line. On weekdays, improve Route 38 frequency to 30 minutes from 6:30 a.m. to 8:30 p.m. with 60 minute frequency for the last trip of the night, leaving downtown between 9:00 and 9:30 p.m. and last trip from 65th St station leaving approximately 8:30 p.m. Add a Saturday trip leaving Downtown Sacramento around between 9:00 and 9:30 p.m. Extend upcoming Downtown SmaRT Ride to cover Seavey Circle and nearby neighborhood. 47 Phoenix Park Eliminate route due to redundancy with nearby routes. Area is served by Routes 56, 67, and 81. 51 Broadway/Stockton Improve Saturday frequency to 20 minutes from 9:30 a.m. to 12:00 p.m. Add Saturday trips beginning from Florin Towne Centre at 6:44 and 7:44 p.m. Improve Sunday/Holiday frequency from 30 to 20 minutes from 9:30 a.m. to 4:30 p.m.
54 Center Parkway Eliminate route. Area west of SR-99 covered by #56, #67, and #81. Area east of SR 99 covered by #68 and new SmaRT Ride microtransit service. 55 Florin/CRC Eliminate route and extend #68 south to cover on slightly different routing. 56 Meadowview Reroute to Brookfield Dr and Franklin Blvd from Meadowview Rd west of Franklin Blvd. Improve Sunday frequency to 45 minutes. 61 Fruitridge Combine with parts of Route 2 and 65 and improve frequency. Eliminate service east of Power Inn Rd and to the Gold Line (riders may transfer to #81 at 65th St). From Fruitridge Rd and Power Inn Rd, extend route south on Power Inn, west on Elder Creek Rd, south on 75th St, west on Lawnwood Dr, south on Briggs Dr, west on Florin Road to Florin Towne Centre. From Fruitridge Rd at South Land Park Drive, extend south on South Land Park Dr, west on 43rd Ave, continuing on southbound Riverside Blvd, east on Florin Rd, south on Gloria Drive, south on Rush River Dr to Pocket Transit Center. Improve weekday frequency from 30 minutes until 7:00 p.m. Add Saturday/Sunday service with 45 minute frequency from 7:00 a.m. to 7:00 p.m. and 60 minute frequency to 8:00 p.m. Maintain two peak-hour shuttle trips on Florin-Perkins Rd (See Route 161). 62 Freeport Reroute to L Street from Capitol Mall in Downtown Sacramento. Reroute from 13th St to South Land Park Dr via 43rd Ave. Add Sunday service with 60 minute frequency from 7:00 a.m. to 9:00 p.m.
65 Franklin/65th St Combine with Routes 61 and 67. 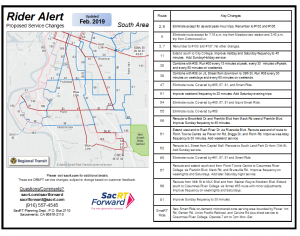 67 MLK/Franklin Reroute off of Florin Rd and instead continue south on Franklin Blvd from Florin Rd to Mack Rd, east on Mack, south on Valley Hi, and south to Cosumnes River College via Valley Hi, Wyndham, and Bruceville. Add two southbound trips and one northbound trip to improve weekday evening frequency to 30 minutes. Improve Saturday frequency to 30 minutes and add a Saturday trip from Arden Fair Mall at 9:22 p.m.
68 MLK/44th St Reroute from Steiner Dr to Stockton Blvd via 47th Ave. Extend route south to cover Route 55. On Stockton Blvd from Elder Creek continue south on Stockton, east on Florin Rd, south on Palmer House Dr, east on Scottsdale Dr, south on Power Inn Rd, west on Gerber Rd, south on Stockton, west on Elsie Ave and south to Cosumnes River College via Valley Hi Dr, Wyndham Dr, and Bruceville Rd. Add two southbound trips to improve weekday evening frequency to 30 minutes. Improve Saturday frequency to 30 minutes. 72 Rosemont Add a Saturday/Sunday morning trip from Mather/Mills station at 7:25 a.m. Add Saturday trips from Mather at 7:25 and 8:25 p.m. and from Manlove at 8:02 p.m. Add a Sunday trip from Mather at 7:25 p.m. and trips from Manlove at 7:02 and 8:02 p.m.
74 Rancho Cordova Combine with Route 75. 75 Mather Combine with parts of Routes 28 and 74. Improve weekday frequency to 30 minutes. Extend weekend hours to 8:00 p.m. New route would go from Butterfield station to Mather station via Folsom Blvd, then continue through Mather Park and parts of Rancho Cordova via Mather Field Rd, Rockingham Dr, Old Placerville Rd, Schriever Rd, Armstrong Rd, Bleckley St, McCuen Blvd, Femoyer St, International Dr, Data Dr, and Capital Center Dr.
80 Watt/Elkhorn Eliminate route. Watt Ave and North Highlands would be covered by new #26 and #84. 81 Florin/65th St Improve Sunday frequency to 30 minutes from 8:30 a.m. to 5:00 p.m. in the eastbound direction and from 9:00 a.m. to 7:00 p.m. in the westbound direction. 82 CSUS/ARC Reroute from Mission Ave, Engle Rd, Eastern Ave, Edison Ave, Pasadena Ave, and Winding Way to Walnut Ave and Winding Way. Improve weekend frequency to 45 minutes. 84 Watt Realign north end of route. From Watt/I-80 station go north on Watt Ave, east on Don Julio Dr, north on Walerga Rd, and west on Elverta Rd to Watt Ave. Reroute from Watt Ave to La Riviera Dr and Folsom Blvd seven days a week (like existing #80). Improve weekday frequency to 30 minutes from 6:00 a.m. to approximately 8:00-8:30 p.m. from Watt/Manlove and add an additional two hours of service at 60 minute frequency. Add Saturday trips from Watt/Manlove station at 7:03 and 7:37 a.m., and at 30 minute frequency until 6:03 p.m., with hourly trips at 6:03, 7:03, 8:03, and 9:03 p.m. and from Watt/Elverta at around 7:43, 8:13, and 8:43 a.m., at 30 minute frequency until 6:43 p.m., and at 7:43 and 8:43 p.m. Add Sunday service with 60 minute frequency beginning in both directions at 7:00 a.m. with last trips in both directions beginning around 8:00 p.m.
86 San Juan/Grand Add weekday trips from Downtown Sacramento at 6:57, 7:57, and 9:27 p.m. Improve Saturday/Sunday frequency to 45 minutes. Add Saturday trips leaving downtown at 9:05 p.m. and leaving Marconi station at 9:11 p.m. Add one hour earlier morning service in each direction on Sundays and extend Sunday hours to 8:00 p.m.
87 Howe Add weekday evening trips from 65th St station at 7:30, 8:30, and 9:00 p.m. and from Marconi station at 7:33 p.m. Improve Saturday/Sunday frequency to 45 minutes. Add Sunday trips from 65th St station at around 6:27, 7:27, and 8:27 p.m. and from Marconi station at around 7:26 and 8:26 a.m. and 7:26 and 8:26 p.m.
88 West El Camino Add weekday trips beginning in Downtown Sacramento at 6:55 and 9:25 p.m. Improve Saturday frequency to 45 minutes. Improve Sunday frequency to 45 minutes from through 7:00 p.m. Eliminate the Saturday trip beginning in downtown at 6:15 a.m. and add a Saturday trip beginning downtown at 9:12 p.m. Add a Sunday trip beginning at Arden/Del Paso station around 7:46 a.m.
93 Hillsdale Reroute from Elkhorn Blvd, Greenback Ln, and Auburn Blvd to Louis/Orlando via Andrea Blvd, Tupelo Blvd, Antelope Road, and Auburn Blvd. Improve Saturday frequency to 45 minutes. Add Saturday/Sunday trips beginning at Louis/Orlando around 7:35 a.m. and 7:35 p.m. and beginning at Watt/I-80 around 7:14 and 8:14 p.m.
95 Citrus Heights Combine with #93. 103 Auburn Blvd Change number to #193. No other changes. 109 Hazel Express No changes. 113 New route running existing #13 trips beginning from Arden/Del Paso station at approximately 6:23 and 7:23 a.m. and at Truxel Rd at approximately 3:56 and 4:56 p.m. Reroute from National Dr to North Market Dr.
161 New route from College Greens station to Belvedere Ave at Florin-Perkins Road, with one morning trip arriving at Belvedere at 7:45 a.m. and one afternoon trip departing Belvedere at 4:15 p.m.
170-173 JIBE Routes No changes. 175-177 Rancho Cordovan No changes. SmaRT Ride Downtown Extend upcoming SmaRT Ride Downtown zone south to cover Seavey Circle and nearby neighborhoods south of Broadway and west of Riverside Blvd. SmaRT Ride Gerber Add SmaRT Ride on-demand microtransit service in the area bounded by Power Inn Road, Gerber Road, the Union Pacific Railroad, and Calvine Road from 7am to 7pm Monday-Friday with non-stop connections to Cosumnes River College station. A presentation of the draft transit networks was made at the SacRT Board of Directors meeting on Monday, December 10. Click the following link to view the presentation: SacRT December 10 Board of Directors Presentation. A presentation on the outreach efforts and proposed updates to the project was made at the SacRT Board of Directors meeting on Monday, January 28. 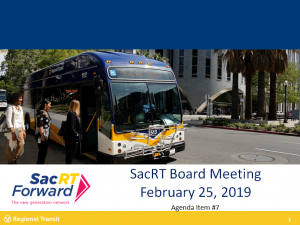 Click the following link to view the presentation: SacRT January 28 Board of Directors Presentation.